Our Secure Salvation: Preservation and Apostasy. Robert A. Peterson, P&R Publishing, P.O. Box 817, Phillipsburg, PA 08865-0817, 2009, 240 pages, $17.99. Reviewed by Michael M. Dewalt Th.M. candidate at Puritan Reformed Theological Seminary, Grand Rapids, Michigan. 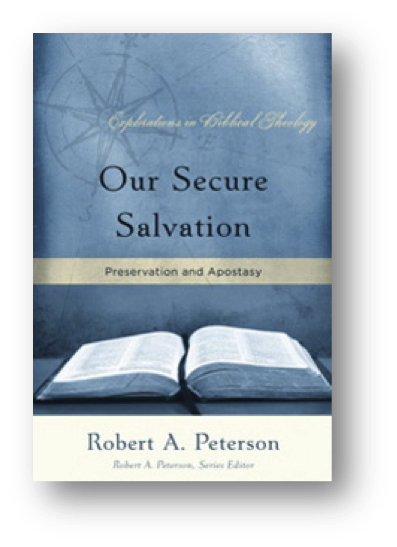 As the subtitle suggest, Preservation and Apostasy, Dr. Peterson’s book, Our Secure Salvation, deals with two crucial doctrines for today’s Christian scene: Preservation and Apostasy. Tracing preservation and apostasy throughout the Bible, Dr. Peterson illustrates how God saves and keeps His people, giving them confidence to live for His glory, as well as how some fall away from the gospel. Peterson examines 18 New Testament passages that teach God’s preservation of His children and their perseverance in faith, followed by 24 New Testament warnings against apostasy. Peterson deals with some of the most important contemporary issues in the church, and relates them in a way that pastors, professors, elders, teachers, and even laymen can understand. In six chapters Dr. Peterson interacts with the final victory over sin, flesh, and Satan, and explains in depth what professing Christians can do today in order to increase their assurance of salvation and not fall away from the faith. This particular focus is clear from the very beginning when Dr. Peterson sets the stage by illustrating how God uses perseverance to help bring His children assurance (pages 1-9). Peterson writes experientially as he covers the relationship between the theme of perseverance and apostasy from a pastoral perspective. There is a list of six questions for further revision and reflection for either individual, or small group study. For those today that struggle with passages such as Hebrews 6, 1Timothy 1, 2Timothy 2, and 2Peter 2, this book will help the reader learn the relationship between apostasy and perseverance in proper context. Also, if one is struggling with their own assurance of faith, Dr. Peterson expresses the ways in which God’s keeping of His elect is a fundamental, warm and heartfelt doctrine of the Christian faith. One question the reviewer was left when was why considerable biblical material, especially from the Old Testament, was left untreated. As a result, the reader of Peterson’s volume gets to see apostasy in the “warning” passages, yet never get the full sense of the theme itself, nor the theology of apostasy throughout the entire canon. As a result, my biggest critique of Our Secure Salvation is that, though it is part of the Explorations of Biblical Theology, yet it only deals with specific texts that treat this theme. Obviously, it is hard to do justice to a pervasire theme or topic of the Bible, such as apostasy or perseverance. Nevertheless, spending only one chapter on the Old Testament for both of these topics is lamentable. Dr. Peterson spends a mere 25-pages on the Old Testament, addressing both the individual and corporate aspects of themes of apostasy and perseverance. Although this chapter is excellent in material, deeper study of the theme, dealing with each of the covenants in the Old Testament, is certainly warranted. Despite the lack of the Old Testament focus and only dealing with the warning passages in the New Testament, Dr. Peterson’s book brings forth the often overlooked topic of apostasy in the church, and does so in a pastoral way. If anyone is looking for a group study or a place to start learning about these topics, Dr. Peterson’s work is simple and helpful in addressing the most asked questions of a person dealing with both—or either—apostasy and perseverance.